Back in 1999, just before the release of The Phantom Menace, Star Wars fever was at an all time high. So high, in fact, that I made an unforgivable gaming error. I trusted the back of the box. It’s a schoolboy error but in my defence I was 16 at the time so still, technically, a schoolboy. The box art made the game look like The Legend of Zelda but set in the Star Wars Universe. You got to be Luke Skywalker on Degobah whislt Yoda trained him filling in some of the plot holes between The Empire Strikes Back and Return of the Jedi. Yup I fell for it all right. I did read a review that said the game was brilliant. But, as I was to learn, reviewers often lie. A lot. Sometimes they’re given money to score certain games higher than they deserve and other times they’re almost blackmailed in to giving games a better score by developers saying if they don’t they’ll not get anymore freebies. And it’s all about the freebies. So I got this game home, put it in, turned it on and was met with a faithful 8bit rendition of The Star Wars theme tune. So far so good… Select new game, there’s that same version of the theme tune, and ooo I’m on Tatooine. And there’s the theme tune again. That’s issue one with the game. There is 21 seconds of music, on endless repeat, and it’s the same bit of music on every single level. Even something as awesome as the Star Wars theme will grow old and fast given that lack of variation. Do not adjust your Gameboy Color. For some reason it really did keep dipping in to the monochrome of the classic Gameboy. As soon as the game starts however you notice issue two. And it’s almost a game breaker. The graphics look pretty good on a static screen, like the screenshots on the box, but there is zero scrolling. None. It just jumps for every single step you take. And after about 4 or 5 steps it’s pretty damn headache inducing. To be honest? It makes the game almost unplayable. I was determined to get my monies worth though and persevered through level one. But it felt like a slog. The controls were sloppy. Combat was awful. You got to wield a lightsabre, an experience that should have been awesome, but it felt like wielding a baseball bat. There was just no joy. You swung it and it might or might not hit your enemies. It didn’t matter if it looked like it hit them or not mind you. The games collision detection felt to be entirely random. 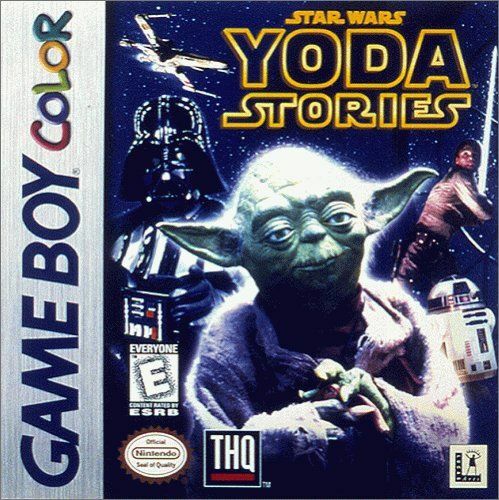 It’s perhaps worth noting that Yoda Stories started out as a desktop game on the PC. The idea was it was a casual game, like mindsweeper and solitaire, something to dip in to for a few minutes at a time here and there. It was casual gaming years before it became an actual thing. The problem was that this did not translate at all to the Gameboy. Recreate that famous opening to Return of the Jedi. You remember the bit right? Where Luke Skywalker attacks a lobster in a desert? Now don’t get me wrong there are a few good points to this one. Well… There’s one good point. The soundtrack might’ve been repetative but the gun and lightsabre sounds were spot on. They actually used audiosamples. So it seems even more weird that the developers went out of their way to make sure that the blasters sounded exactly like Star Wars blasters should but they somehow forgot to make the game playable… Not only that they took nearly THREE years to port the game from PC to the Gameboy. Given that amount of time (the game was originally meant to launch simultaneously on both formats), and the amount of delays this game saw, we were rightly expecting a polished masterpiece. What we got? Well it wasn’t even a polished turd.